Boy has summer camp changed — not just for kids, but also for parents. I’m not talking about the activities, or the accommodations, I’m talking about the technology. These days many camps want kids to be unplugged. They tell them to leave their phones, laptops and other electronic gadgets at home, so they can actually have real conversations with their friends in the bunk. But for parents, technology has opened up a whole new world as far as camp is concerned. My friends who have kids at sleep over camp no longer have to complain that they only received one extremely short letter asking for more loom rubber bands. They no longer have to sit at home waiting for the mail to arrive, because now they can just log on to their computer. Camp photography has been life changing for parents. 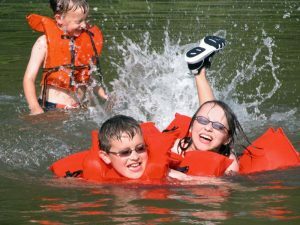 With just a few clicks you can open up a gallery of amazing photos that makes you feel like you’re actually living the camp experience, and, more importantly, living your child’s experience at camp. Camp photos now make it okay that your kid is not a writer, because you know that he did take a dip in the pool, she was brave enough to try the zip line or that lacrosse stick you sent is actually being used. In addition to providing a window into your children’s camp experience, the photos can help parents feel like they’re getting their money’s worth. After all, look at all the things your children packing into just one day. While parents of kids at sleep away camp schedule their day around viewing pictures, moms and dads who have kids at day camp are just as eager to catch a glimpse of their little ones having fun. My kids are spending their first summer at day camp and, although they are very young, their personalities are already coming through. My daughter seems to find the camera on a daily basis. I’ve been told they call her ‘Cheesey’ because she’s always willing to smile for the camera. If she’s a camp photographer’s dream, her brother is another story. I often joke that I’m not sure if my son attends the same camp. I drop them off together in the morning, but he rarely makes an appearance on the daily photo posting. And when he does, he’s often in the periphery with his back turned to the camera, only able to be identified by his clothing. While parents yearn for details of how kids are spending their day, a picture is not always worth a thousand words. Are we getting too used to knowing every detail? Do kids want and need their privacy? If the images are there, of course parents are going to look. But we need to remember not to let the pictures replace conversation. Make sure to still ask your child what they did that day at camp. Find out how things are going from their perspective. While everyone is always smiling in pictures. — what’s happening behind the scenes? Encourage your kids to keep writing those letters, because a picture can’t always share what your child is thinking or feeling. Enjoy what technology has to offer, but don’t let it replace personal communication. With that said — searching for your child in camp photos can be the highlight of a parent’s day. And the best part: the kids ALWAYS look happy. They only post pictures of them having fun. And that’s all you’re really looking for. It’s not so much about you seeing them, as it is you knowing that they are having a good time. And even if your child is sad, you won’t know it, because the pictures you see makes it seem like life at camp is one big party! So be glad you’re a parent in the digital age. This way you don’t have to sit home and wait for the mail.